Since the beginning of the universe we’ve been getting requests for stickers, shirts, coffee mugs, etc. Well, several of the writers have the ability to produce this stuff in their homes. The boss liked that and gave us his blessing to start selling Hack a Day stuff. In the interest of keeping the cost as low as possible, right now the store is located inside of my personal online store. The only products we have right now are stickers, since I make them myself. Though if enough of you pester him, maybe [Devlin] will make up a batch of those Hack a Day badges. Please be patient with the store. It is fairly untested and tossing this many people at it at once is somewhat frightening. If you have any problems at all, please contact me (caleb@) and I’ll take care of it. You can get to the store by clicking the new button on the right of the screen, labelled “store”. You can see a few more pictures after the break. Note: Thos of you who are outside of the US, please just contact me directly. I have to figure out your shipping outside the system. Don’t go fill out an order. Mind if i ask what (tools/mark) do you use to make these ? They seem very neat ! I use a 24″ vinyl cutter. I expected a hack-a-day store to sell electronic components and tools. We only sell stuff that WE make. Since we aren’t in the business of marking up and selling goods. needs a shirt, and black versions of the stickers. Multiple colors of stickers coming soon. I think I’d like to put a sticker on my laptop, but I’m worried that if I use it on campus or in a coffee shop, people will not like the fact that my laptop says “hack” while I share a network with them. That’s a valid concern and one that I’ve struggled with. For example, my briefcase has one centered on it. I get troubled looks when I walk around with that! 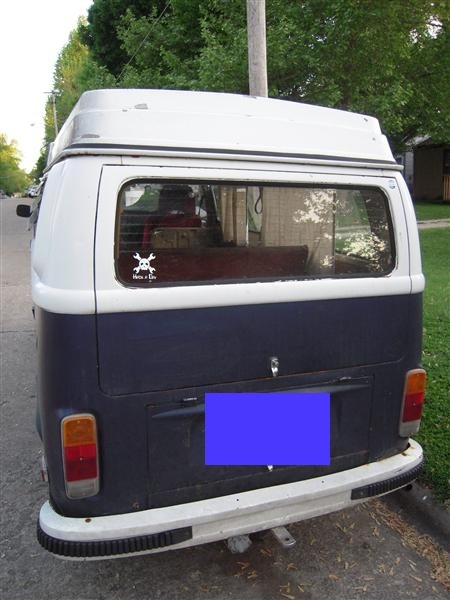 It’s just full of stickers though(I do a ton for the vw community). The only sticker i’ve had the people looking for reasons to be upset about get humpty about is the “i hack charities” one. Please please PLEASE make t-shirts! Maybe a different version of the logo with just the initials H-A-D instead? Love to see a shirt though! Hm, I’d also like to place one of those small stickers on the back of my laptop. @Caleb: Could you check about shipping to Germany? email me please. go to the store to find the contact info. I need to know for sure what size sticker you want, and your address. Cool. You should definitely whip up some of those badges, I would assume they would sell like hotcakes. Maybe you should host a contest for tshirt design submissions, because a HaD shirt would be nice. I’m impressed, the image popup worked on my Blackberry as opposed to just opening it as a file. +1 to You Good Sir! I remember when I first found this site and Caleb was one of the only writers that I can remember. This site has come a long way. Who doesn’t want a skulls and wrenches sticker?! Caleb I perused your site and qualification page and stumbled onto your PC Arcade/LAN, SOOO COOL! What ever happen to it? CS:S tourneys!! Awesome man your a stand up guy. Fanatexe was awesome indeed. I went on to do a web design studio (which I hated) and neglected the arcade. I sold it to my employees for dirt cheap and they ended up closing it soon after. Been a big fan of the site for a few years now. Would like to contribute something back. I’m a proud geek, but make a living as a tattoo artist for 16 years now. I would love to design a few shirts and I have a few friends with a large tier silk screen press. Is this something you guys might want? Or am I just wasting my time? Not right now, but maybe in the future. We might do another shirt contest or something someday. baby steps, baby steps. We (especially the boss) probably wouldn’t like you selling stuff with our logo. That being said, we’re always open to new product ideas. What do you have in mind? But I still would want one! If the hackaday logo free to use? Could I for example make something for sale including it or is that against some kinda trademark issues or something? Yes, well I mean, copyrighted (or similar) or not, I like to be nice so I am fine with that. It would imply that I was in some way affiliated with the company which of course I am not. You guys gotta make sure you make at least one style of shirt with with like just the logo, on the back and maybe some little thing on the front… and another really cool is to make shirts similar to the ones “Torrent Spy” had before they got shut down, they were awesome! but they never had anywhen I tried to order them… IDK just some thoughts. Yeah, the first one will be just the logo. All of our stuff is made by us, in our homes. That’s part of what makes it special. Tell us more about the torrent spy shirt. You could just sell iron on T-Shirt transfers maybe as that would be much easier than selling whole T-Shirts. I’m sure pretty much all the people who read hackaday can manage to use an iron and not get the transfer upside-down! I may do that as an intermediate step. I can get heat transfer vinyl that is professional grade, not like best-buy iron on. That would be excellent as it could be applied to things other than tshirts. PLEASE PLEASE PLEASE PLEASE please please tell me it’s not just CafePress stuff? I hate that site. Nope, not cafepress. I tried it and didn’t like it. This is all produced, in house… in MY house. As we add products, it’ll be because one of US is actually making them. I REALLY want a mug, white with hack a day log in black. That’d look super sweet at my research desk, the other E.E’s would be jealous. I’ve always wanted the hackaday stickers, I’m glad you guys have finially opened a store and it is even better that you are doing it yourselves. I’d order a bunch of stuff right now, but as I’m out of the U.S.A I’ll wait till a wider range of items are available, in an attempt to keep shipping down. That’s really awesome of you Caleb. There’s definitely been a huge demand for em. 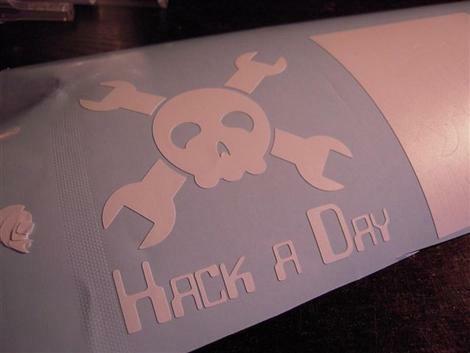 I’m gonna go ahead and put my hand up for a hackaday shirt ortransfer when its possible, I’ve always wanted one. Oh, another thing – I’d love to see some Hack A Day lanyards! If you’re interested, I can tell you where I got mine from – 100 was $208, I can send you one if you’d like to take a look at it. Pretty inexpensive for a decent lanyard. If you need the designs,I already have them done.Lol. Im sure everybody wud want one. Let me know if you are interested. you can make T-Shirts with heat transfer vinyl. it cuts on the same machine you already have you just need to use a heat press. and yes i know its not as good of quality as silk screened but its not that bad if you buy good vinyl. You have a T-shirt sale here. Will buy a sticker or 2 here shortly. Wasn’t wanting to make money off them. Was going to donate them. Really not interested in doing a contest either. And I would never change your logo. It’s the sh*t. But layout can be everything on a shirt. Anyways, baby steps. I like to visit hack-a-day but I can’t say I especially like the logo or want to identify with the site, it’s not a political movement or something after all, or some club, it’s a site with hack/electronic links, and a handy place to look for past links and experience with certain devices. Please carry some ESD safe stuff if you can? @NatureTM; While explaining might soon become a PIA that is the only reason I’d consider putting a HAD sticker on a portable computer. Otherwise I’m not big on stickers. How ever soon most will learn there is no threat. You could make and add a hardware hacker sticker to go with it. Caleb and HAD might consider adding a blurb supporting hardware hacking to the basic logo or the URL. Blocked out the license plate totally? I figure You all had a vanity plate with something HD related. Ummm, yeah… I write for HaD and I don’t have a shirt yet. So +1 to selling shirts. Thanks for making this stuff happen Caleb! ps- Loving my stickers already. I’ll be playing with doing them this week(silk screens instead of vinyl transfers). Continuing with the plan that everything is actually made by ONE OF THE HAD STAFF. I won’t be ordering mass produced shirts. I feel this sets us apart, and makes our schwag mhttp://hackaday.com/wp-admin/#comments-formean something more.